﻿St John Baptist de La Salle (April 30, 1651 – April 7, 1719) was a French priest, educational reformer, founder of the De La Salle Brothers and is the patron saint of teachers. De La Salle dedicated much of his life to the education of poor children in France, and in doing so, he started many lasting educational practices. De La Salle thereby began the order of Brothers. 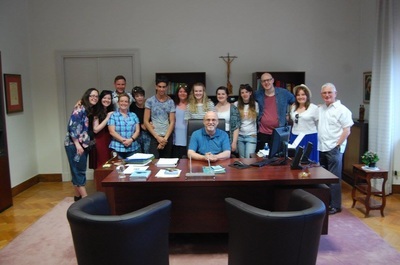 This has now grown into the Lasallian Network we know today, which consists of the following regions: Europe and the Mediterranean (RELEM), Pacific and Asia (PARC), Africa and Madagascar (RELAF), Latin America (RELAL) and North America (RELAN). 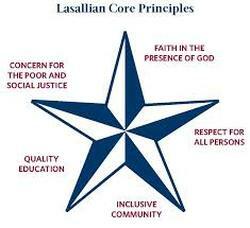 The de La Salle Brothers were the first Roman Catholic teaching religious institute that did not include any priests. Let us remember we are in the Holy presence of God - Response: And let us adore him. Live Jesus in our hearts - Response: Forever!